It is extremely important that you do not give a directive response like, “Go ahead and Warm-up!” But simply say, “I will be right with you!” and continue to stay away. What does this have to do with our player’s lack of development? Anyone who has traveled abroad will tell you that it is only a matter of time before you come across children playing soccer in pick-up games. We also know that ALL world class players learned to play in fun games organized by older kids in their neighborhood. Yes, they learned the tricks-of-the-trade in free-style games where they experimented and failed their way to success. Think about it, while our children are waiting for their parents to drive them to the next practice and then wait for the coach to tell them what to do. Children around the globe walk to the nearest open area in their neighborhood and adjust it to be soccer playable. Strange as it may seem no one has ever seen them organize a ‘drill’ of any kind. They use what is available and simply lay-out the environment to start playing their version of soccer. Why aren’t our players doing the same? My personal opinion is that our players do not play pick-up games simply because no one has taught them how important, helpful and fun they are. We have a coach controlled environment where the coach controls all aspects of practice and provides constant direction. This controlled environment subconsciously teaches our players that they cannot play soccer without adult assistance. I believe that it is our duty to teach the players that they are responsible for laying-out and adjusting all playing environments in each and every practice. This is very simply accomplished by using the same traditional steps that we use in teaching them technique or tactics. Step 1. EXPLANATION – Communicate in simple everyday language. Create ‘buzz words’ words that ‘trigger’ the mind to highlight points of emphasis. Some examples: “warm-up area”; “1 vs. 1 field”; “small-sided 3 vs. 2 field”; “small-sided 5 vs. 5” field; etc. Take into consideration the attention span of your players and adjust the length of your explanation accordingly. After you have dealt with a point ask question to make sure the point was understood> Repeat the verbal instructions only if necessary. Be brief! Step 2. DEMONSTRATION – Give a demonstration slowly, simply and visually correct in how you want each playing environment to be laid-out. Show them the difference, for example, between a 1 vs. 1 field and a 4 vs. 1 field. Show them items that can be used to layout the environment such as: cones, flags, shoes, bags, etc. Step 3. ACTION – Have the players show you that they can correctly lay-out the environment you request. Help only those who need help and increased speed as they become proficient at accomplishing the task. I Do and I Understand! Step 4. 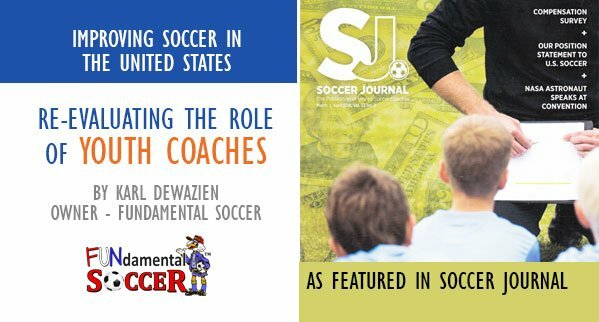 ASSIGN HOME PLAY – The key to dramatic player improvement is their playing some type of soccer whenever and wherever possible! Your encouragement in this step is vital..! Step 5. ASK them how often and where they played these games as they arrive at every single practice session. Write down their responses to let them know how important this is to them and you. When applying these steps: Be patient and do not expect immediate result. Be persistent because It will take time and effective repetition. Maintain that sense of humor letting your players work in a relaxed atmosphere and reward progress with a positive reaction, a positive comment or a smile! An argument can be made that a coach may end up using a great deal of energy teaching them ‘how to’ layout the environment. Considering that this initial investment worked for the older neighborhood kids around the world. Surely it can work for us coaches here in the USA..!